Try this: Start at track five. Unbroken is a strange beast, an abomination of sorts, a fully-realized album with an extra head and shoulders sticking out of the midsection. It feels like a record company's doing, as if Demi Lovato had 10 perfectly good songs ready to go and just before they got the green light, some suit somewhere whispered "psst psst My December psst", and the label threw a ton of money at her manager so she could go make some pop songs. She did, and every single one of them got put right at the front of the album. Given that the entire scenario above is pure speculation, that's probably not how it went down. Still, that's what Unbroken sounds like. It sounds like a ridiculous, vapid little pop EP preceding a solid and occasionally goose-bump-inducing pop album. Even Lovato herself sounds like a different person from tracks 1 through 4 than she does from tracks 5 through 15, and the effect is utterly jarring. Try this: Start at track five. It's called "Lightweight", and the way it starts is just lovely, a vocal synth patch singing simple descending arpeggios, and Lovato starts gently singing a simple love song. She makes a few of the typical "she's still young" sorts of mistakes, going for the huge notes way too early and digging a little too far for her lower register, but really, all the vocal acrobatics and overdone production in the world can't detract from the fact that this is really just a pretty love song in 6/8 time. It would be a beautiful, surprising, subtle way to open an album. That out of the way, we can get to the dancing. Much as the album's structure all but forces the listener to hear the album's first four tracks as the dancing/party songs and the rest of the album as the "serious" songs, there is dancing to be done in the latter half. "Unbroken" pulses forward in a way reminiscent of the ridiculous(ly huge) Selena Gomez hit "Love You Like a Love Song", while "Hold Up" offers some truly effervescent synth work, despite the vapid lyrics. These songs aren't all drudgery. Still, even in those songs, there's an undercurrent of melancholy; "I'm gonna love you like I've never been broken" is almost startling in its perceived honesty, whether Lovato actually wrote the line or not, and "I hope you ache, ache, ache" in "Mistake" is well-placed pop anger (in a song reminiscent of "Halo"/"Bleeding Love", despite not being the requisite Ryan Tedder production) at its best. Is this really the same girl that, early in the album, asks the object of her affection "Am I your only shorty"? The first four tracks are so utterly vapid, such complete and utter dance-floor hit fodder that it would be completely understandable if a listener gave up on the entire album after two or three of them. A Timbaland beat that JT never used, an appearance by Jason Derulo, a team-up with Dev (she of "Like a G6" fame), and the aforementioned "shorty" song, which actually uses the word "shorty" more than 20 times ... which is ridiculous, but no more so than any of those other songs it accompanies. 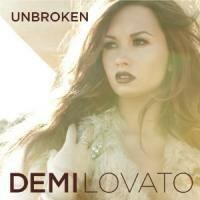 Unbroken would be a far better album without them, but like it or not they're there, sitting right out in front. It'd seem tragic if such a descriptor wasn't being used to describe an album so laced with actual, genuine tragedy.